A week has passed since the events that overshadowed the most eagerly-anticipated event in mixed martial arts history. Until it deviated from the script, UFC 229 was an outstanding spectacle that provided no shortage of entertainment. However, Khabib Nurmagomedov's decision to climb out of the octagon and attack one of Conor McGregor's cornermen was the first in a series of quick-fire incidents that has left the sport in the spotlight for the wrong reasons. The Russian had just successfully defended his UFC lightweight title, so the sight of such a senseless act was scarcely understandable to many who witnessed the images on news bulletins across the globe. However, this was the culmination of a fallout that started brewing six months previously in New York, when Nurmagomedov was the target of a bus attack by McGregor and his associates. In Dana White, the UFC have a president whose comments are sometimes at odds with his actions. In the immediate aftermath of the bus attack in Brooklyn, White described the incident as "the most disgusting thing that has ever happened in the history of the company". 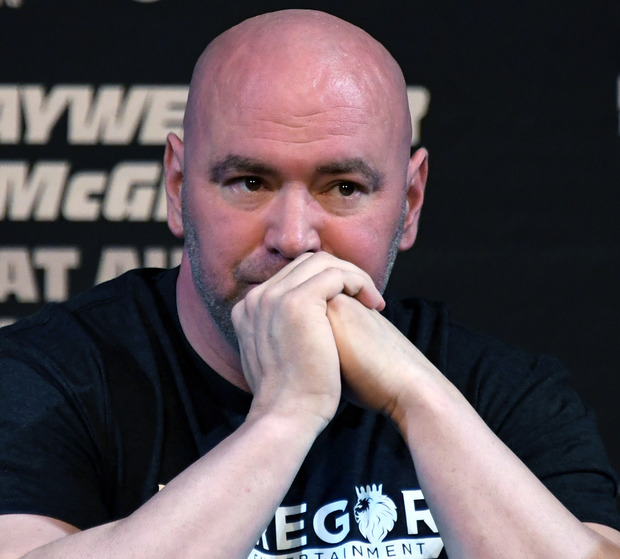 However, the UFC's decision to use footage of that very attack in the promotional videos for last weekend's fight was as bad an own goal as one is likely to witness. White's demeanour was similar in the aftermath of the brawl that overshadowed UFC 229, using words like "disgusted" and "sick" to describe his mood. However, when asked about the possibility of a rematch between Nurmagomedov and McGregor, he wouldn't rule it out. The sad thing for Nurmagomedov is that until he jumped into the crowd to attack McGregor's cornerman Dillon Danis, he was primed to emerge from the fight and its build-up smelling of roses. The subsequent decision of two of his team to then storm the octagon and attack McGregor merely compounded a dire situation. Much of the commentary has been hysterical. Some question whether MMA can recover. However, the figures from the event illustrate a sport in a healthy place. Ticket receipts of $17.2m (€14.8m), generated from a sell-out crowd of 20,034, represents a staggering figure. The pay-per-view audience has yet to be confirmed but it is believed to have been in the region of 2.4 million. That equates to more than €120m and dwarfs the 1.1 million pay-per-view customers who stumped up for the biggest boxing event of the year, Canelo Alvarez v Gennady Golovkin. Barely five hours had passed when McGregor took to social media to declare his desire for a rematch. The sheer money-making potential of such a showdown means the UFC is unlikely to oppose it. However, with more than €100m in the bank, McGregor is a very rich man and has little to gain from squaring off with Nurmagomedov again. The convincing nature of the Dagestani's victory, which culminated in a fourth-round submission, was a sobering viewing experience for those who expected more from McGregor. It could be argued that a 23-month absence had left him rusty but that is a weak foundation to build an argument upon. His greatest asset - his left fist - was ineffective. Meanwhile, all the popular commentary suggested that Nurmagomedov possessed no punching power whatsoever. The right hook that sent McGregor staggering across the octagon in the second round dispelled that myth. Punching power aside, Nurmagomedov had more tricks up his sleeve than McGregor could fend off. He was brave, but this was a mismatch from the start. McGregor's coach, John Kavanagh, had said a rematch could take place at some stage next summer. However, Kavanagh was also clear that he would prefer if McGregor's next outing was against Nate Diaz. That would certainly appear to be a more sensible option. They have already served up two thrilling encounters, winning one each. This would be billed as the deciding fight and it has a ready-made audience. Crucially, McGregor can actually beat Diaz. Kavanagh's admission that he could understand Nurmagomedov's post-fight reaction could be interpreted as his way of saying that McGregor went too far. The trash-talking in the build-up to UFC 229 focused on the ultra-sensitive topics of religion, family and nationality. By the time Nurmagomedov had scaled the octagon and his associates had attacked McGregor, the poison of a toxic environment had infected the crowd at the T-Mobile Arena. Fights broke out in pockets of the arena and that violence spilled out on to the streets of Las Vegas. It was a menacing atmosphere that could be traced back to the bus attack, before intensifying in the days leading up to the fight. White says he will never tell fighters what they can and can't say. However, the scenes that followed last week's fight should perhaps force him to revise that view. Matters relating to family and religion are too sensitive. If the events surrounding UFC 229 haven't made that clear, then White is either missing the point or washing his hands of any responsibility. Neither excuse is good enough for the president of an organisation that is valued at more than €5bn.